Night School, the racing industry’s national online fan education program, puts the game’s best feet forward this Tuesday when a panel of sports and racetrack celebrities discuss “Why I Love This Game.” The season’s 29th of 40 Night School lesson plans also will include an in-depth preview of Saturday’s Grade 1 Travers Stakes as part of the Jump Ball segment during the final half hour of the 90-minute class, which begins at 8:30 p.m. ET. Among those confirmed to be in the live chat and interacting with fans are a pair of National Hockey League greats, 2000 NHL Hall of Fame inductee Denis Savard of the Chicago Blackhawks as well as Eddie Olcyzk, a 16-year NHL star and former Pittsburgh Penguins head coach who now works in the broadcast booth. The star-studded panel also includes NBC Sports’ Rob Hyland, lead producer for America’s top-rated television program “Football Night in America,” as well as for NBC’s Olympics and Triple Crown horse racing coverage. Famed track announcer Dave Johnson, the longtime Triple Crown voice on ABC Sports, also will be in the live chat alongside noted sportscaster and NBC Sports horse racing analyst Bob Neumeier. Tuesday’s Night School session will be co-hosted by Horse Player NOW’s Jeremy Plonk and Joe Kristufek, and also will include video input from top-rated ABC-7 Chicago news anchor Ron Magers, Hall of Fame trainer Bill Mott and classics-winning conditioner Kenny McPeek. As usual, this week’s Night School will be followed by another “After Night School Special,” featuring live racing from Mountaineer Park, from 10:00-11:00 p.m. ET. The segment will cover the late daily double in real time with free, live-streaming video and complimentary Daily Racing Form past performances. 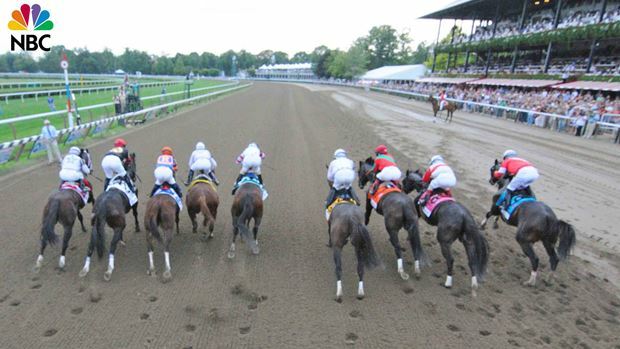 The Night School Tour traveling troupe will be on hand at Saratoga Race Course this Saturday and Sunday in conjunction with America’s Best Racing and the New York Racing Association to man the Racing 101 Fan Hub at the Spa. Night School’s Joe Kristufek, Caton Bredar and Jill Byrne will be joined onsite by Horse Player NOW’s Brian Nadeau to provide interactive, fan-education lessons throughout the day. Presenting title sponsors for Night School are the National Thoroughbred Racing Association, American Quarter Horse Association, Keeneland, Churchill Downs, Inc. and Daily Racing Form. Tuesday’s session will be the 29th of 40 Night School lesson plans throughout the 2012 season, which continues through November.